Rediff.com » News » Want to ride the world's biggest bicycle? Want to ride the world's biggest bicycle? Rising fuel prices is not the only reason to consider riding bicycles. Hyderabad resident K Sudhakar's creation will make look at the most efficient mode of transport in fresh light. The wacky automobile designer had come up with the world's biggest cycle. "It took me two-and-a-half years to design and build this bicycle," he told rediff.com. "With this feat, I am going to break the record currently held by a bicycle built in the United States, which is 23.4 feet high. My bicycle is 42 feet high." The cycle weighs three tonnes and the diameter of its wheels is 17.5 feet but 'one person can peddle it'. "I am ready to give this giant bicycle to the government for public viewing in Hyderabad," he said adding, "I am seeking an entry in the 'Guinness Book of World Records' and am in touch with the publishers." Sudhakar, promoter of Sudha Cars, has earned quite a name for himself. 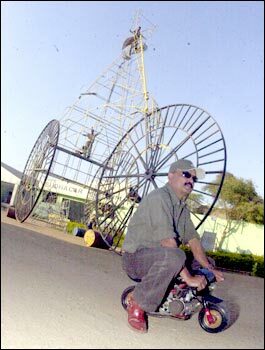 He has designed 28 types of cycles, including the smallest bicycle in India, which is only six inches high; 12 types of motorcycles, the smallest being 13 inches high; and 49 types of cars and buses, including the smallest double-decker, which has found a place in the Limca Book of Records and was authenticated by the Guinness Book of World Records. He has built cars shaped like a brinjal, camera, suitcase, shoe, toilet, cricket ball, lotus etc. He had built a motorbike in the shape of a condom. He has also designed mini trains, saloons, automobile homes, mobile canteens, mobile toilets, amusement rides and go-karts. Most of these are on display at Sudha Cars Museum, based in Hyderabad.